Frank Lloyd Wright’s Heller House is on sale in Kenwood. Three years after being listed for sale, architect Frank Lloyd Wright’s Isidore H. Heller House in Hyde Park is back on the market. The Heller House was the first of Wright’s Hyde Park projects, constructed in 1897, five years after the establishment of UChicago. 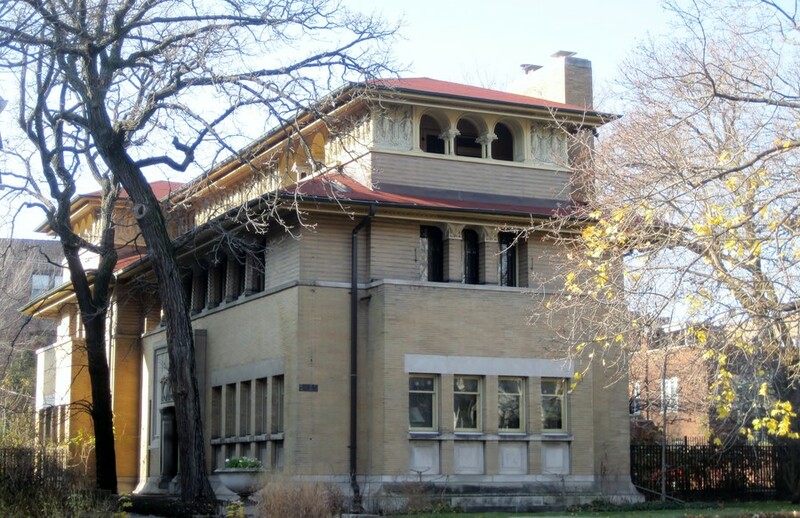 Located at 5132 South Woodlawn Avenue, six blocks from Wright’s Robie House, the residential property is recognized as an early example of Wright’s transition to the Prairie School architectural style. The residence was designated as a Chicago Landmark in 1971 and added to the National Register of Historic Places in 1972. According to Zillow, the three-story home measures 6,100 square feet with seven bedrooms, four bathrooms, four fireplaces, an elevator, stained glass windows, and oak floors. The house is situated on a narrow 75 x 165 foot lot and has a two-car garage. The Heller House has been bought and sold several times since its construction, most recently in September 2004 for $1.8 million. According to Curbed Chicago, the residence was put up for sale for $2.5 million in January 2012 and spent 1,000 days on the market. The price was lowered by $75,000 before the listing was taken down. On November 10, the house was put back on the market for $2,425,000.